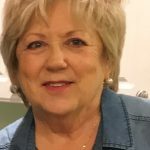 Janice Kaye Bevins Burrows, 67, died on September 28, 2018 in Granbury, Texas. Born in Drumright, Oklahoma, Janice grew up in Borger, Texas. She earned an associate degree from Delmar College in Corpus Christi and a Bachelor of Science degree in 1983 from Corpus Christi State University. Her career as a health-care and insurance executive took Janice from Corpus Christi, Texas, to Chicago, Illinois, to Minneapolis, Minnesota; she retired to Granbury in spring 2013. Janice volunteered for CASA and Ruth’s Place Clinic; she attended Acton United Methodist Church and served for two years on the Pecan Plantation Architectural Control Committee. Janice enjoyed travel in the U.S., Canada, Mexico, Central and South America, Europe and Africa. She loved and spoiled her Scotties. Survivors include her sister, Sherry Bevins Darrell, of Evansville, Indiana; stepson, R.H. Burrows, of Flagstaff, Arizona; cousins Dave and Ladonna Bevins of Granbury and Terry and Kristine Bevins of Stinnett, Texas; many, many beloved friends. At Janice’s request, there will be no services. Please send memorial contributions to Acton Friends of Animals, 2885 Fall Creek Highway, Granbury, Texas 76049; or Hood County CASA, 3611 Plaza East Court, Granbury, Texas 76048.